The Mark-8 was a microcomputer designed in 1973, based on the Intel 8008 CPU (which was the world's first 8-bit microprocessor). The microcomputer was designed by graduate student Jonathan Titus and published in the July 1974 issue of Radio-Electronics magazine as a 'loose kit' microcomputer. Today, Mark-8 is featured in the computers section of the Smithsonian. 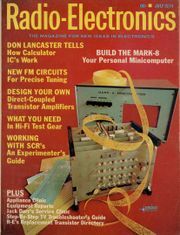 In the July 1974 issue of Radio Electronics the Mark-8 was the cover article. It offered a $5 booklet containing circuit board layouts and the Do It Yourself construction project descriptions. Titus arranged for $50 circuit board sets to be made by a New Jersey company for delivery to hobbyists. There were a couple of thousand of booklets and several hundred circuit board sets that were sold. The kit did not contain all the electronic parts which made the buyers have to gather the various parts on their own. The Mark-8 was introduced in the Radio Electronics article as "Your Personal Minicomputer." This may be readily understood considering that the 'microcomputer revolution' had yet to happen. The word 'microcomputer' was still far from being a common term. Thus, in their announcement of their computer kit, the editors quite naturally placed the Mark-8 in the same category as the era's other minisized computers. Early when we started this project we were looking around to see if we could get our hands on a Mark-8 or its components. Luckily near the beginning of the project we were able to find and win an eBay auction that gave us all of the Mark-8 boards and most of the components. We have since then been trying to put it together but according to the testimony of other hobbyists it takes around 2 years to truly complete and get it running. The parts are scarce these days since the technology is now over 30 years old. The Radio-Electronics Mark-8 Minicomputer is a complete minicomputer which may be used for a number of purposes, including data acquisition, data manipulation and control of experiments. It may also be used to send data to a larger computer or to a terminal such as the Radio-Electronics TV Typewriter (September 1973) ad it is essentially interfaced with a keyboard. The keyboards do not have to be ASCII encoded since the minicomputer itself can convert the input code to an equivalent ASCII code for output. This Minicomputer is not a glorified calculator and it is not intended just for educational use. It can be interfaced to a calculator (a possible future project if readers are interested) to perform complex mathematical routines, and it may also be used as a teaching tool. Introduction of Mark-8 caused immediate impact in the computer hobbyists circles and spurred the formation of the Mark-8 Computer User Group, which published a newsletter. It may be interesting to see how computer-power hungry users, not only hobbyists, looked at Mark-8. Here is a letter from the National Bureau of Standards where Mark-8 was considered for application in the instrumentation for nuclear reactors (reprinted from Mark-8/Micro-8 Computer User Group Newsletter, Vol. 2, No. 4, March 28, 1976). Jon with his brother, Dr. Chris Titus and David G. Larsen designed several other pieces of computer equipment. 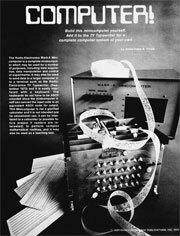 In 1976, they designed the "Dyna-Micro" computer, also featured in a Radio-Electronics cover story (Vol. 47, issues May and June 1976). It used an Intel 8080 chip and it had a small keyboard for entry of octal op codes. Three output ports provided connection pins for experiments as well as eight LEDs each. During data entry, 16 LEDs indicated an address and 8 LEDs showed the data entered into that location. So, entering a small program using the on-board Keyboard Executive (KEX) firmware was easy for students. That design was licensed to E&L Instruments, a company in Derby, Connecticut, which renamed the computer the MMD-1 or Mini-Micro Designer. The computer provided 512 bytes of EPROM (256 bytes for KEX and 256 bytes available on a user-accessible socket). It included 256 bytes of SRAM, expandable on board to 512 bytes. Eventually it also included an add-on board that increased EPROM and SRAM space, two UART serial interfaces and an audio-cassette interface for data storage. Copyright Notice: All articles on this page are reproduced with kind permission of Dr. Jonathan A. Titus.